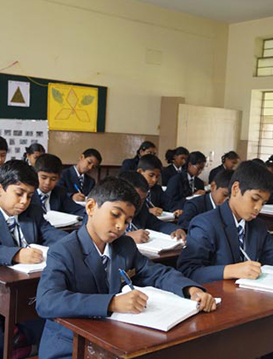 The daily study of the student is assessed by the teachers by means of oral tests and assignments or activities as part of the CCE (Continuous Comprehensive Evaluation). It is also tested by means of formative assessments and summative assessments. Attendance in all examinations is compulsory. There will be no re-examination under any circumstances. The minimum pass mark is 35% in each subject. The syllabus in all subjects will be divided into two semesters and there will be a summative assessment at the end of each semester. Evaluation will be based on the student’s continuous academic performance during the year. There will be two terms in every academic year. Each term will have two formative and one Summative Assessment. Overall grade of Formative Assessments over the two terms (FA 1 + FA 2 + FA 3+ FA 4) and the overall grade of Summative Assessment (SA 1+ SA 2) must be given. The total of two grades which comprises (Formative and Summative) needs to be given in the relevant column. The results of these are communicated to the parents by means of marks card issued at the completion of every examination. The marks card will be sent home after each unit test and terminal examinations Parents are expected to sign it and return within two days. School (Classes VI-X) fees could be pain in three installments. II installment:- September 1st to 10th. III installment:- December 1st to 10th.